I had only been driving for about an hour, when I decided to stop at Gloucester services for food, the first time I was actually feeling hungry for three days! I paid for my food and sat down, but as I reached for my bottle of water, I realised that I had lost the feeling in my left hand. I tried to ignore it, even though I knew something wasn’t right and I left the water and ate my food! However, when I was heading back to the car, I dropped my phone and keys, and again my left hand wouldn’t do what I wanted it too? Once in my car, I realised I couldn’t get into reverse, because my left hand just wasn’t functioning! I became stuck between two gears and soon saw that the engine had started to smoke! There happened to be a couple of motorway maintenance guys in a car behind me, so as mortified as I was, I headed over to ask if they could tell me. They came over and had a look, and not long after that, I remember them saying they were calling an ambulance and I was off to Gloucester hospital! I just want to go home and sleep! Waiting in the hospital, I texted Jan to let her know what was going on! This text must’ve been a bit mumbo jumbo, as she later told me that I said I loved her. Whoops, that one was meant for my husband! 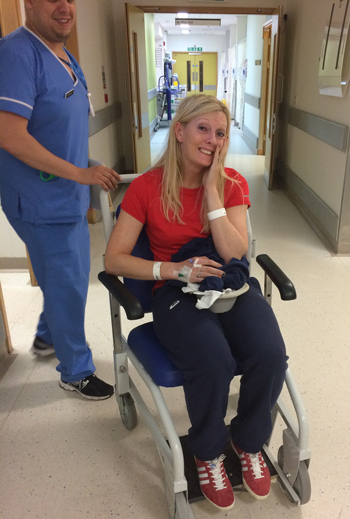 Jan was racing the Points race, but she came to the hospital from Newport to make sure I was ok – she had literally just got off the track and suddenly here she was looking after me. They sent me for an ECG (I think that’s what it was) and said I would get an MRI scan first thing in the morning, liars! It was actually 6.15pm when I finally received the promised scan. Jan was back with me at this point and tried to find out what was going on, she asked the questions that I couldn’t, as to be honest, I don’t think I was able to function properly. Eventually they came back with the results, however, I was told that they were “wishy washy” – whatever that meant. They eventually diagnosed an oedema (a collection of fluid in the brain), but they weren’t 100% sure and certainly were not able to suggest any treatment, so they discharged me (yes really!). Jan came back to Gloucester to rescue me and away we went back to her home. We had a celebratory meal back at Jan’s, whilst she and David were taking the pi** we had a good old laugh that it was nothing serious! I got up on the Monday morning and after breakfast I was ready to try to get home to Edinburgh again. It was at this point that I got some very bad news. I was sitting in my car saying my goodbyes, when I receive a call from my doctor advising me that they had reviewed the MRI from the day before and, with a fresh set of eyes on it, apparently it was clear that I had a blood clot on the brain and needed to head back to Gloucester hospital for treatment urgently. It was really hard for me to take and I started to cry and threw the phone to Jan. Within minutes we were on our way back to the darned hospital. As soon as I arrived, I was put on a drip for four hours and received very painful injections in my stomach. I was then told I would have to do this myself, twice a day for next six months! Myself! No chance, I decided I would be going to my doctors to get them to do the injections, as I didn’t trust myself getting that right. Once my drip was done, Jan came back to Gloucester to collect me and we headed back to hers ..again! I was sure I had only left that day, but couldn’t quite remember and I headed home eventually. I made sure I stopped for a break, as my head was still sore but I didn’t care, I just wanted my bed. I arrived back in Edinburgh at 00:30 and went straight to bed, but I had only been asleep for 30 minutes, when I woke having some sort of seizure, I had pins and needles everywhere, my head felt like it was going to explode, I was hyperventilating and very very scared! My whole body wasn’t functioning properly and so I couldn’t use my phone. This eventually stopped after a couple of minutes, even though it felt like a lifetime, and I was able to call an ambulance, so I was off to the Edinburgh Royal Infirmary. I was left in an empty room from 1am until around 12pm that afternoon. I was really hungry by that point when they offered me a sandwich. Athletes don’t just have sandwiches, especially when they had starved me for so long! Eventually a neurologist came to see me, I liked this guy. He explained a lot to me, more than anyone else had, and he changed the daily injections for tablets – which I was so relieved at that I wanted to jump up and hug him. I didn’t! So, from being told my headaches were nothing serious (back in November), to being diagnosed with an oedema (on the 29th June), I was then told on the 30th of June, that my symptoms were of “extensive Venus sinus thrombosis.” Indeed, it all rather makes you wonder?? Anyhow, I’ve been taking my tablets and so far I have had no more headaches and as I write this, I am waiting on my check up from the hospital to see if the clot is vanishing. 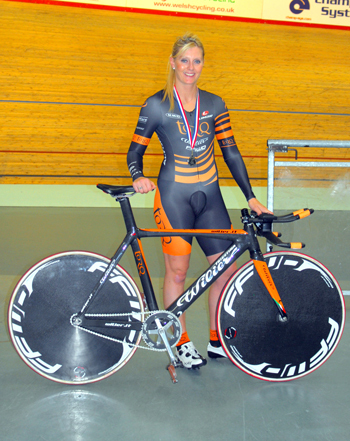 I am hoping to ride the Scottish Track Championships in mid-August, but since I have not been able to get on my bike for a month, it’s looking a little too hopeful – but I’ll keep you updated. For now, thanks for reading and thanks again to all my sponsors!